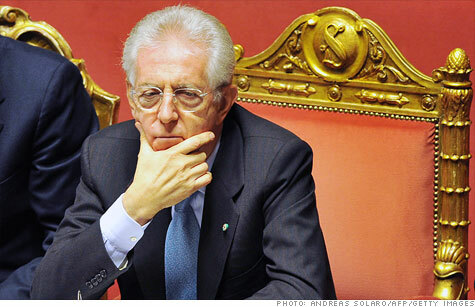 Italian Prime Minister Mario Monti looks on during a session at the Senate in Rome as lawmakers discussed a new austerity package. NEW YORK (CNNMoney) -- Italian bond yields rose above 7% on Friday as worries about the government's debt problems resurfaced. The yield on 10-year Italian government bonds edged up to 7.04%, after falling below 6% earlier this month. Italian yields first topped 7% in November amid fears that Italy could fall victim to the same debt crisis that led to bailouts for Greece, Ireland and Portugal. But yields dropped sharply in the first week of December on hopes for a comprehensive solution to the eurozone debt crisis. The uptick Friday comes one day after the Italian Senate gave final approval to a €30 billion package of austerity measures backed by newly-appointed Prime Minister Mario Monti, according to local media reports. The goal is to balance the government's budget and revive the ailing Italian economy by cutting government spending and enacting broad structural reforms. Spanish bond yields also moved higher, rising to 5.37% from 5.07% earlier this week. But yields on 10-year Spanish bonds are still below the 6.7% high hit in November. Meanwhile, the yields on German government bonds ticked higher, while France's borrowing costs eased. Investors have been closely watching yields on euro area government bonds this year for signs the debt crisis is spreading to larger economies such as Italy and Spain. The concern is that the Italian government, which remains solvent, may not be able to service its debts and fund its activities if borrowing costs hold above 7% for a sustained period. Italy, the eurozone's third largest economy, is considered to big to fail. At the same time, eurozone political leaders have struggled to convince investors that the currency block has enough bailout money to rescue the country if it gets into trouble. Despite the rise in Italian and Spanish bond yields, stock markets across Europe moved higher in quiet, pre-holiday trading Friday. U.S. stocks were also higher in early trading, with the Dow gaining about 0.4%. Traders were also focused on data from the European Central Bank on Friday that showed a sharp increase in the amount of money European banks parked at the central bank's overnight deposit facility. Some analysts had hoped European banks would use long-term loans from the ECB to buy bonds issued by troubled euro area governments. But the jump in overnight deposits suggests that banks are more likely to keep the extra cash in reserve.